My daughter held out a plastic cutesy-animal toy. Its target market was probably girls in the six-to-eight range. She is eleven. “Sure,” I said. My wife raised an eyebrow. I knew what my wife was thinking. I was thinking it too: eleven is early adolescence. My daughter is increasingly insistent on expanding her borders and participating in everything from adult conversation to chores around the house. She is also developing a recognition for “cool.” At the same time she still wants to play, specifically “pretend stories.” She'll take this toy home, and probably generate several weeks' worth of stories with it. But odds are high she's going to lose the urge to “pretend” with toys at some later point this winter. Is this money wasted? I don't want to be among the chorus that ridicules and shames her out of the impulse. I googled “value of play” and turned up dozens of links to high-falutin' character-development theories. Education theorists are particularly concerned with its efficacy. It's tempting for me to jump on the bandwagon and blow my one-note trumpet — I privately played out stories of my own right into my teen years. Eventually I grew too self-conscious about the practice, and opted instead to sublimate visa vis the written word. If these theories were accepted at face value, I would surely qualify as the very flower of humanity: emotionally secure, comfortable with compromise, facilitator of discussion, etc. I won't argue, but my family might. The concern for these theorists is the utilitarian value of play. Go ahead and read that last sentence again, then tell me you don't spot an oxymoron in there somewhere. Hey, if one of these eggheads wants to identify the fiber in my Sunday morning danish, they're welcome to it. So far as I'm concerned, the sound of an eleven year old girl projecting funny voices on funny animals and cracking up her younger sister is fine for what it is: a happy girl having fun. Long may it continue. As with Disc One, Disc Two continues my godson's initiation into the soundtrack to the early life of his old man (and me). “Trumpet Of Jesus” The Imperials We start with an oddity that was meant to be an anthem. A friend of mine slipped this number into a mixed CD of otherwise lovely music which I first saw fit to play at a party. The event came to a full stop as the crowd witnessed me nearly wetting my pants with laughter. “Trumpet” isn’t offensive, like this Imperials number — it’s just flavorless corn. I couldn’t subject my godson to the whole thing, however, so I cut it short after the first few bars and closed it with the sound effect of a stylus being pulled across an LP. “Drugs In My Pocket” The Monks My high school basketball team, of which I was not a member, used to warm up to Bad Habits. I don’t think any of them realized The Monks were actually a parody act — I know I didn’t. The song is pretty silly, alright, but not a little catchy, too. I was actually looking for their other greatest hit, “Nice Legs Shame About The Face” but had to settle for this. This was my regular retreat during our Winnipeg visit: McNally Robinson's new outlet in Polo Park. 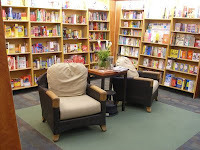 Unlike their competition, that other Canadian Mega-lo-Bookstore, McNR still offers its browsers comfortable seating. This is the vantage point from the central customer service hub. Various shelves extend out from it, like spokes on a wheel. The effect for the first-time customer is a little discombobulating, but not unpleasant. Even though I suffer a touch of agoraphobia, I didn't seem to mind getting spatially disoriented by shelves of books. Once I located the exits, I was happily ensconced in my "natural" environment. 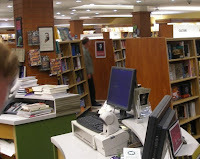 Speaking as a former bookstore employee, I suspect the store's design probably looked stunning on paper: staff at the hub have fairly clear sight-lines through most of the store. In reality, there is no one perch where a single staffer has a clear vision of the entire store. Theft is a problem that dogs bookstores especially; I saw several arty "package" books that had been opened and pilfered, a sight that always depresses me. With bookstore profit margins growing slimmer each year, this has got to be of grave concern to management. That aside, I've got nothing but love for this place, and wish McNR every success. 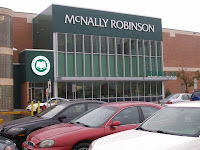 The official McNally Robinson site is here. Great Expectations: Can I Get A "LOC" On That? Now that Nick Hornby has gone AWO my L from the pages of The Believer, I am sorely tempted to pick up the slack and post my own list of Books Bought/Books Read (A, A). Unfortunately I do not read or process the written word nearly as adroitly as Hornby does. Note the rotating images on the right sidebar of this blog. Everything “On The Floor” is what resides by my side of the bed. Note also that of the current four I've only bothered to comment on one. Of the remaining three, one is a periodical (the interview with Mike Davis is very beguiling, and has me searching for titles in his back-catalog), one is an artfully constructed pillow-book that keeps me from sleep (author Dennis Danvers explains why), and the last is a novel that intimidates me because (a) it is written by a contemporary who is (b) masterfully covering material and an era that I once, in a rare and prolonged fever of ambition and logorrhea, attempted to capture and portray. The Successful Novelist by David Morrell (A). I recently rented and re-watched First Blood, then watched it with Morrell's commentary on. Two things struck me: (1) there was a time when Sylvester Stallone, or someone very close to him, had an impeccable sense of what made for a captivating story, and (2) David Morrell, whose novel was markedly different from the movie, has a very agreeable and pragmatic approach to craft. When I pulled this book from the shelf and opened it up I was pleased to see him quickly address and dispose of the usual (and often unspoken) reasons for writing fiction: wealth and fame. “As Rambo's creator, I have experience in that regard, and if your idea of a good time is to be forced to get an unlisted phone number, swear your friends to secrecy about your address, and make sure your doors are locked because of stalkers, you're welcome to it.” The guy still loves what he does — teaching and writing — so I'm looking forward to reading his thoughts on the process and the business. Likelihood of my reading it to completion: lead-pipe cinch. The Abstinence Teacher by Tom Perrotta (A). I thought Perrotta's Little Children was one of the better books I read last year, so I picked up his latest to be remaindered. Based on the bookflap alone, Perrotta's concept doesn't seem as likely to surprise me to the degree that Little Children did, but his narration is usually wry enough to get me laughing and cringing at the same time. Likelihood Of Completion: high. The Translator by John Crowley (A). So far as his admirers are concerned, and I count myself among them, Crowley can do no wrong. But to be perfectly honest: after Little, Big I've had trouble making it past the finish line with his novels. This one is only 295 pages long, and I like the concept: “The Translator tells of the relationship between an exiled Russian poet and his American translator during the Cuban missile crisis, a time when a writer's words — especially forbidden ones — could be powerful enough to change the course of history.” LOC: better than Aegypt, not as good as Little, Big. JPod by Douglas Coupland (A). There is a scene that occurs in the later pages of Microserfs where one of the characters, after being exposed to some of the more extreme instances of body-piercing, blurts out in a state of horror, “But your body is your hard-drive!” I laughed when I read that, because by that point of the novel I knew exactly what she meant. Depending on the critic, Coupland is either praised or decried for his devoted attention to the superficial. I'm in the “praise” camp, because he frequently plumbs surprising depths with his superficialness. LOC: so-so. I finish half the Coupland books I pick up. At the time of its publication Microserfs was an easy finish. JPod is its long-awaited follow-up, so you'd think my chances of completion should be good. 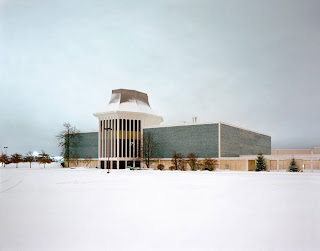 However, since the book was published its material has cooled somewhat: the CBC produced a short-lived series based on the book. What little I saw certainly qualified as “superficial.” I'll have to shake off a few memories for me to finish this baby. The Devil In The White City by Erik Larson (A). It's been a while since I last purchased popular history. When I was in my 20s I was in the habit of reading one such book every month. By the close of my 30s that had dwindled to one a year. LOC: pretty shaky. The World's Religions by Huston Smith (A). This is the spinach in my literary diet. I thought Smith's written response to his buddy Marcus Borg was uneven, but provocative enough to get me wondering what he made of the “competition” so I went ahead and bought this. LOC: fair to middling. And how many of these are likely to be read by the end of this month? Mmmmm ... one, maybe two. So, no: a monthly attempt to ape Mr. Hornby should be avoided at all cost. It's best if I just return my blogular attention to the second disc of my summertime soundtrack. The soldier thinks he knows fear. Tell that to the farmer. I have corked off at battle's eve and snoozed sound as stone; now on my landsman's bunk I tossed, sleepless as Cerberus. The farmer greets the dawn with one query only: what calamity has struck overnight? So intones Polemides, the chief narrator of Stephen Pressfield's Tides Of War (A). Polemides then provides a litany of the farmer's woes which is as entertaining and as depressing as anything George Carlin cooked up in his prime, and concludes with a punchline that is note-perfect in its absurdity and acuity. The jacket blurbs extol Pressfield's portraits of ancient battle, and although they are what the reader remembers most immediately Pressfield's real genius is exercised in his gradually persuading the reader of a seemingly "foreign" point of view. Why would a farmer, who has already experienced the torments of the battlefield, return to war on an enterprise that seems shaky from the outset? How, then, do the survivors of the debacle then persuade themselves to re-engage in battle? How do we, the "Army Of One" generation, understand a culture that commits itself to war through an ideology cultivated beneath a skein of temperamental gods? What sort of genius takes possession of the one man who acts as catalyst for all these terrible engagements? Pressfield's evocation of the emotional lives and metaphysical musings of his ancient subjects subtlety lulls the modern reader into a state of self-recognition. And that, I think, is what makes Stephen Pressfield one of America's finest living novelists. "I'm gonna drive like I never been hurt"
Props to anyone (besides DV) who can name the song/composer of this lyric. If the name doesn't spring to mind, you're missing out on one of this summer's great CDs. Our family is driving west for another Winnipeg gathering. As far as blogging is concerned I'll do what I did last year, then return to the contents of The Summer Soundtrack, Disc Two. Stay tuned for a few random shots of The Old Smoke.